Dupont Circle, looking North. Photo, April, 2014. The District is planning to build a deck over Connecticut Avenue at Dupont Circle. It will be between Dupont Circle and Q Street. This will improve the area, but it may be disruptive to riders of the 42 bus. What's missing is the exact plan. The District may create what's called "An Oasis" or "Promenade." This will keep the service lanes and some level of vehicle access. It may leave the 42 route unchanged. There is a petition drive in the District championed by Greater Greater Washington to eliminate the service lanes and use the deck-over to create a pedestrian-only space. If this proposal wins -- dubbed a piazza -- it will mean relocating 42 bus stops. 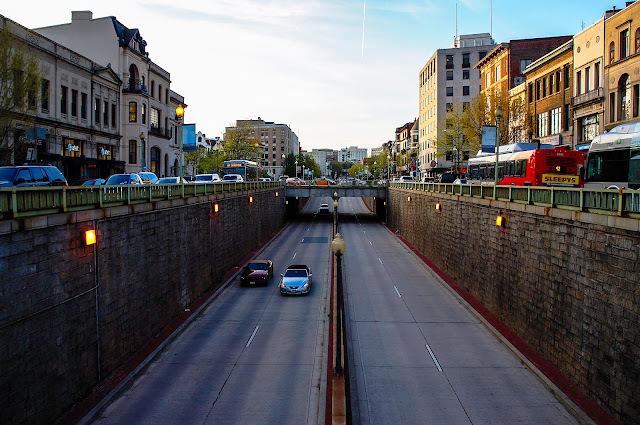 GGW acknowledges that "closing the service lanes entirely would require changes such as rerouting the 42 bus to surrounding streets or using the underpass rather than going through Dupont Circle." The piazza concept is championed as "pedestrian friendly." For 42 bus users it is not that. One idea is to have the 42 -- similar to the 43 bus -- travel under the circle. This means it would stop at S Street. The distance from the existing 42 stop from Q to S is just under a third of a mile. The piazza plan scrambles 42 access for everyone for a large section of Connecticut Avenue and Dupont Circle. It may be that the planners decide it's just better to reroute off Connecticut Avenue, but it's hard to see how that might work. The flag I want to raise is this: A decision to reroute the 42 has major implications for Adams Morgan and anyone else who uses this bus. It would be prudent for Advisory Neighborhood Commissions up and down the 42 bus route to pay attention and make sure their voices are heard. What the piazza supporters are asking for seems reasonable: Let's study a pedestrian-only deck-over. But they are also trying to build political momentum for the no-service-lane option. If the District agrees, then people who don't want the 42 rerouted will be on the defensive once WMATA solicits comments on the rerouting plan. The GGW is a great organization. It's becoming a lobby force, but it does not represent or speak for the vast majority of people who use the 42. It tends to skew young, representing the energy and vitality of people who want a more bicycle and pedestrian friendly city. For these folks, walking a little extra distance is no problem. For many others in this city, it is.